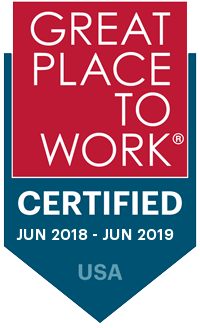 We are pleased to announce that Brown Parker & DeMarinis Advertising has once again been certified as a Great Place to Work® by Fortune for 2018. While it’s certainly an honor to achieve that title, what’s more important is the teamwork, collaboration, respect, nurturing and guidance that continues to enable us to earn it. The bottom line? For us, being a Great Place to Work is a journey, not a destination. That’s because being named a Great Place to Work is really a byproduct of our commitment to each other—across every level—to take care of one another and always improve. It’s about more than the culture at BPD. It’s baked into our business model of service excellence. We serve one another as tirelessly as we serve our clients—and it’s this dedication to serving each other that makes BPD a great place to work. And beyond the commitment leadership has made to continually improve the experience of every BPDerrr—from industry-leading benefits to training, education, mentorship, charity and more—it’s really a testament to living our values as best we can. For every BPDerrr—every day. If you are interested in learning more, you can see our 2018 results here. And if BPD sounds like the kind of place you’d thrive, we’re always looking for the next BPDerrr!